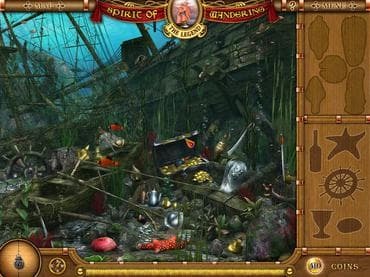 Sail the seas with the captain of the Spirit of Wandering to a variety of locations and search for hidden items that will free her cursed crew and point the way to her missing love. Decipher brain-bending riddles and use magical tools to discover precious items drifting between this world and the next. Featuring gorgeous scenes, an original story and hours of hidden object fun, Spirit of Wandering - The Legend seeks to answer the question: Can true love really conquer all? Even death? Find out in this romantic quest today! More About the Spirit of Wandering Game: - Gorgeous Scenes to Search; - Original Storyline; - Loads of Challenging Levels; - Hours of Hidden Object Fun; - 6 stages; - 24 levels. If you have questions about Love Story: Spirit of Wandering game, please contact us using this form.